I am a mother of four who loves to cook and collect cookbooks! I’ve turned my love into a business featuring meal delivery and catering services, but I also like to share recipes that will help busy families get dinner to the table! For more information about my frozen meal delivery options AND my catering services, you can email me at contact@sunflowersupperclub.com. In my business I cook healthy and delicious fresh foods with minimal processed ingredients. I prepare food for clients how I want my family to eat! 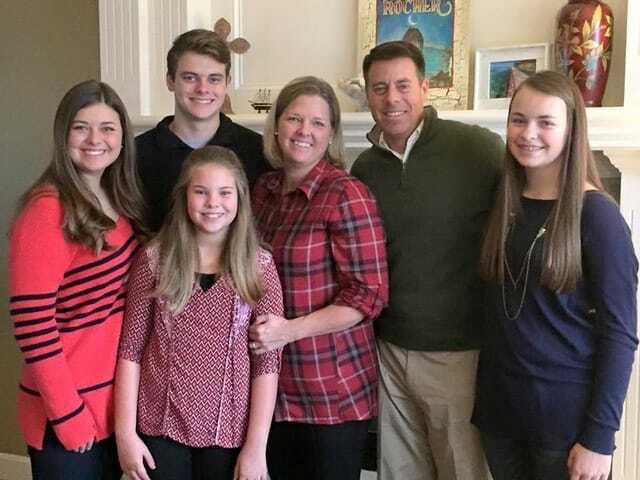 I’ve been married to my husband Dan since 1993 and we have four kids to keep us busy. During the early years of our marriage Dan was active duty Navy, and we enjoyed moving where the Navy sent us. We lived in Florida, Texas, Oklahoma, and then back to Florida. Dan left active duty and went into the reserves and now flies as a commercial airline pilot. We moved back to our home state of Kansas in 2003. I’m a self-taught cook and have always enjoyed trying new dishes and tweaking things to fit my family’s tastes. Email me here. 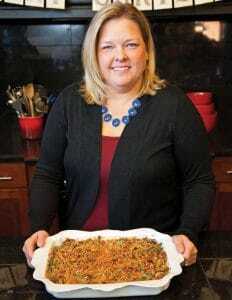 Click on the photo of Kim with the green bean casserole to read a feature in the Hutchinson Magazine. I live in Hutchinson, Kansas, where I am raising my family and enjoying my business, the Sunflower Supper Club, which provides meal delivery and catering for customers in the area. A small city of the size I think is “just right,” Hutchinson (nicknamed “Hutch”) is home to the Kansas Cosmosphere and Space Center, the Kansas State Fair, the National Junior College Athletic Association men’s national basketball tournament, and Strataca, the Kansas Underground Museum. Because of the salt mines that run under our city, Hutchinson also has a second nickname of “Salt City” and a unique high school mascot known as the Salt Hawk. Our world-renowned Prairie Dunes Country Club has hosted the U.S. Women’s Open in 2002, the U.S. Senior Open in 2006, and the Men’s NCAA Golf Championship in 2014.